There are many different areas to stay at in Phuket, right in the action on Patong Beach, or a little more tranquil at Kata or Karon Beach. I stayed at Rawai in the south which is very quiet but close to many Thai boxing camps and Naiharn Beach. There are many beaches in Phuket, for me Nai Harn is the best, maybe because I went there early morning for Thai boxing before a swim. Karon Beach is a perfect picturesque beach which is not too busy. Patong Beach can get busy but Patong is the main town in Phuket for fun and nightlife. On the beaches of Phuket, you usually pay for the loungers and shade, which is negotiable. There are several Thai Boxing camps, mostly in Rawai. Thai Boxing has a reputation of being a rough sport but at the Thai Boxing camps you can train Thai Boxing for weight loss (as I did). As there is a lot of cardio involved you will lose weight very quickly. If you have a month spare in your life and you want to lose weight / get toned as quickly as possible then I’d recommend a stay at a camp. Having said that I was using the Thai Boxing camp to lose weight, I was encouraged to go for a real Thai Boxing fight at Bangla Thai Boxing Stadium in Patong. I was asked several times to go for a fight and was even offered $300 to fight but I decided against it, would you let somebody potentially knee or elbow you in the head for $300?. There were some westerners who were going for regular fights at the stadium and earning money to pay for their stay in Phuket. A visit to the Bangla Thai Boxing Stadium in Phuket to watch a few Thai Boxing fights makes for an interesting nights entertainment. You’ll see adverts for James Bond Island tours everywhere in Phuket but what is it? Why is it called James Bond Island? Back in 1974 when Roger Moore was James Bond, The Man with the Golden Gun movie was filmed on this island. Ever since the release of the movie, tours to James Bond Island from Phuket became popular. A good reason to go on the James Bond tour would be to see the unique landscape of cliffs in the ocean. Another good reason would be if you are visiting famous Bond sites around the world (maybe you’ve already visited Udaipur in India!) or maybe you’re a huge Roger Moore fan, he was the best Bond after all. The Island you visit is very small, you see most of the Island in the famous gun scene when they stand back to back and walk 10 steps. A visit to James Bond Island is to visit the movie location and see the beautiful islands and cliffs in the water. If you want to see beautiful beaches and turquoise / green water you won’t see these on the James Bond Island tour, for this you need to go on the Phi Phi Islands / Similan Islands tours. 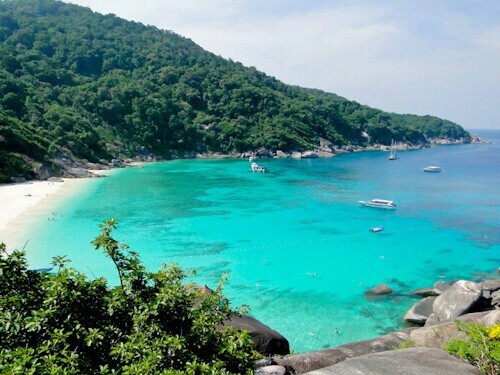 From Phuket it’s possible to make a day trip to the Similan Islands in the Andaman Sea. These Islands are beautiful and the paradise you imagine when you travel to Thailand. You’ll find Donald Duck Bay in the Similan Islands (above). The company you visit the Similan Islands with will probably provide you with snorkeling equipment but don’t forget to take your underwater camera so you can snap the exotic fish. Phi Phi Islands are the islands to visit if you want to see beautiful beaches and turquoise colored water. The Leonardo DiCaprio movie The Beach was filmed on Phi Phi Islands (above), the exact Island they filmed on was Phi Phi Leh. It’s possible to visit Phi Phi Islands on a day tour from Phuket or you could visit independently and stay overnight. There are a few temple experiences to enjoy in Phuket such as Wat Chalong (above). Another religious monument which is visible from various points of Phuket is the 45 meter tall Big Buddha. The Big Buddha monument has been built on top of a hill in Phuket, there is a paved road that leads up there from Chalong. The views of Phuket Island are wonderful from the Big Buddha. As the Chalong Temple and the Big Buddha monuments are religious it means that entry is free. A wonderful place to see the sunset in Phuket is from Promthep Cape viewpoint which is on top of a hill close to Nai Harn Beach and Rawai. I apologize for sitting in front of the sunset! If you decide to photograph each other with the sunset behind then I recommend you use the flash so you don’t become a silhouette. From Phuket there are many shuttles driving directly to Penang, Malaysia. They normally set off in the evening and travel through southern Thailand to the border at night. In the morning they cross the border and arrive in Penang at around 9-10 am the next day. 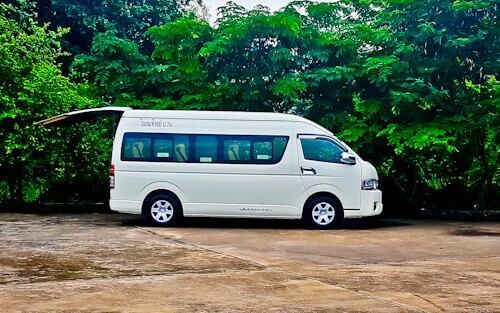 The reason there are shuttles to Penang is because many Thai expats need to travel to the Thai visa office in Penang to purchase new visas, fortunately those traveling one way to Penang can use this service too. It has been a dream of mine to visit Phuket for so long. Every photo I’ve seen looks like heaven. But, beyond the photos I didn’t really know that much about Phuket. So interesting that so many movies were filmed there and that you can also get a shuttle to Penang quite easily. I’ll have to keep that in mind for when I finally get to visit! Whoa! Reminds me of the Jason Bourne movie where he does boxing to meet the living expenses in some South Asian country! I didn’t know of this boxing scene in Phuket! Interesting indeed. Oooh. Those turquoise waters and those island landscapes look just stunning! I would definitely like to train Muay Thai too. You look fit and healthy! Muay Thai is cool and a total body workout. 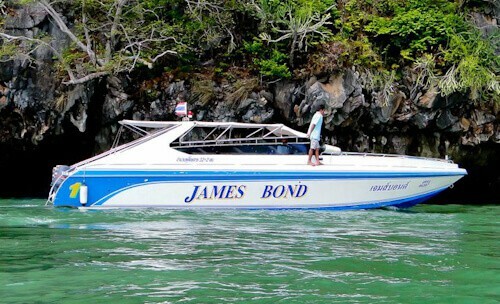 I did not know that James Bond has a famous landmark in Thailand. The beach looks awesome! I must admit I got in and out of Phuket as quick as I could on my visit last year. But I didn’t realize how many Thai Boxing camps were there. I may have been tempted to stay. Looks like your time there was worthwhile you look so different from your profile picture because of the weight loss. Incredible! Kudos on the training! Sounds like something I’d like to do, and I’m sure I’d have an internal struggle too if I was ever offered a chance to fight. One of the first times I saw a picture of Thailand was from The Man with the Golden Gun (still one of my favorite Bond films), so it has always had a soft spot in my heart. I’m hoping to visit next year for my birthday! I’ve avoided Phuket due to all the Australian tourists. Now I’m more likely to consider it for some Muay Thai training thanks to your recommendation. Though there’s no way they could convince me to fight for reals in a stadium! Wow, these are some incredible photos. I’ve always wanted to go to Thailand, this just gives me even more reason to plan a trip. Thanks for sharing these incredible beaches. Loved the beauty of Similan Islands and Phi-phi Islands.The water is so crystal and clear. I am not that much of boxing type but my husband loves it so it would be fun for him to try Thai Boxing on Beach. Big Buddha and Chalong temple will also attract me due to religious importance. Nice photographs with lovely description. Thanks for the post. I have read alot about Thailand and Phuket, but never from this perspective. It is so refreshing to hear a different side of a well know place. The boxing camps look grueling, and I can certainly find better ways to fund my travels than getting my skull beaten in like some of the people you described. The timing of your post about is James Bond Island with the recent passing of Roger Moore. He will always be the one that I think of when I think of James Bond. I agree, Daniel Craig is a good James Bond but I think Roger Moore will always the best! Phuket and the day tours look so beautiful! I have never seen such good photos of Phuket! I just knew about it because one of my friend traveled! Great Photography, it was wonderful reading your article. I didn’t realise that you could stay at Thai Boxing camps for weight loss – a good way to stay in shape when on the road! 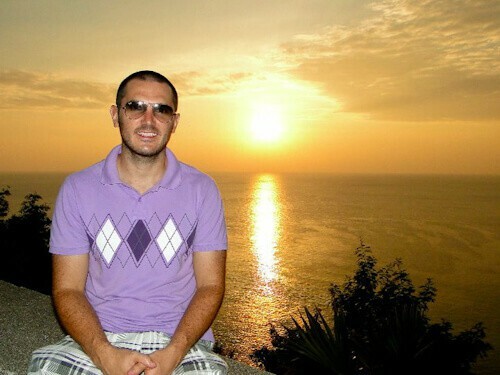 I went to Phuket a long time ago and it’s been on my list to get back to one day as I didn’t make the most of my time. I wish I’d gone up to see the Big Buddha and the sunset. The Similan Islands are somewhere I’ll have to get to next time – your photos are beautiful! Phuket is somewhere I’d love to visit. I’ve been to other parts of Thailand, but ran out of time. The boxing camp looks awesome! And that water color, just stunning. Thai boxing before a swim sounds like a lot of fun and a great exercise! The James Bond Island looks amazing. I would certainly go on their tours when I get the chance. I also enjoyed watching The Beach and I really want to visit the exact island they used to film! You had a wonderful vacation! Learning Thai boxing must have been an amazing experience and it’ s good that you didn’t go for a fight to earn some money. Hahaha.! I would love to visit Phi Phi and James Bond Island for sure. Have heard a lot about it. There are is so much to do in Thailand. I wanted to know that, how much is the cost for a solo traveller to live in and around these islands? Well done on going for the Thai boxing training – that’s awesome! I bet it was quite an experience. I had forgotten all about that ROger Moore Bond film having scenes in Thailand, until you just reminded me. It’s a pretty cool place, and I guess the popularity of those tours shows how much people love a movie location. I never made it to Phuket when I visited Thailand, and I’m actually kind of glad about that. Beautiful photographs of Phuket. The water looks so transparent and a mix of green and turquoise, I’d love to swim there. Looks like wonderful day trips are possible from Phuket. Planning to make it a base when I travel there. I need to invest in a underwater camera before that. Love the shades of water there. I used to live in Penang and didn’t know that Phuket is so close! Phi Phi Islands sound like the perfect place for water activities. I’d love to go there to to snorkel or scuba dive! Going to Phi Phi islands has been a dream of mine ever since I watched The Beach! I wasn’t aware of how popular Thai boxing is, I love boxing, but I think you did the right thing by not participating in those fights! Interesting to watch for sure though. Thanks for all the Phuket tips, especially the day trips. I love the Phuket region too, James Bond Island and Phi Phi were some of my favourite spots too. Phang Nga is also incredible. Will have to go back so I can visit the Similan islands too. This area of Thailand is so beautiful! When I was there I honestly, kept thinking I found the ultimate paradise….until I visited the next place and was even more blown away. I especially liked some of the quieter islands over there like Koh Lanta & Koh Jum! I also did the overland crossing to Malaysia but went to Langkawi instead and was so happy with how quick and easy it was to get a visa. I visited Phuket way back in the late 90’s with my parents, and whilst it’s only a vague memory, what I do recall was how beautiful it was. I’d definitely do far more day trips to refresh my memory, but we did Phi Phi and James Bond island – it was just gorgeous! Oh how awesome. I’ve been to Phuket but only to mai Khao in the north – wish had seen more. James Bond island looks great and the Thai boxing sounded exciting. 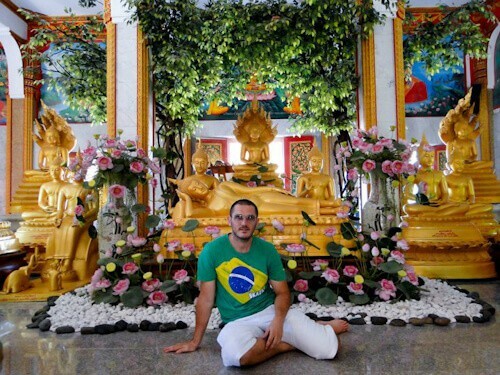 My friend who just moved to Thailand has been training in Thai boxing for weight loss as well. To see a Thai boxing match in Bangla stadium would be cool. I would love to visit Phuket and the surrounding islands of Phi Phi James Bond and Similan, the James Bond Island tour especially sounds like fun. Hi Maggie, yes Penang and Georgetown were wonderful, I will be writing and sharing photos about my time there very soon! I remember going to Phuket before and promising myself to go again in the near future. Your post definitely jumpstarted my desire to visit Phuket again, I’d love to make day trips to Phi Phi, James Bond and the Similan Islands. Totally cool you did some training in Phuket, I didn’t realize how many camps there were there. Great article though, I was feeling a bit nostalgic reading this lol. I visited Phuket and I had an amazing time! I havent watch James Bond movies so I choose my day trip to Phi Phi Island and see the movie location from “The Beach” . I wish I had more time over there as it was truly the best place on earth ! I wish I could stay there forever! Phuket was lovely too! Great food, beaches and nightlife! A lot do to over there! Haha you were offered $300 to fight? That’s hilarious! Do they just offer money to random westerners to fight?! I really love Phuket (not Patong) and I’d love to go back for the food, sunshine and beaches soon! Hi Flo, they probably ask all westerners who are there at least 4 weeks to go for a fight in the stadium, the ladies too! Apart from the usual stuff like checking out the beaches of Phuket, would love to try some Thai boxing on the beach 😀 That photo looks pretty awesome. Wow, the pictures of the Similan Islands are incredible. The water is so blue and picturesque, I wouldn’t have guessed that was in Thailand. There is so much to do around Phuket, I’ll have to check it out on my next trip. I love this! We spent part of our honeymoon at Kata beach and it was lovely! The sand is powdery soft and the water is so clear! Phi Phi Island is definitely a must-see place if visiting Phuket. This post has me dreaming of banana pancakes and mango sticky rice! Thailand is such a lovely country and its beaches and islands are veritable treasures. When we were in Thailand a couple of years back, due to time constraint we were restricted to exploring Bangkok and Pattaya. Hope to get back to explore some of the other treasures like Phuket. I would love to head out to James Bond Island, being a great fan of the Bond movies. Phuket is a very diverse island and you explain it well in this post. There are some serious tourist traps that are fun to visit but it also has the idyllic beaches as you describe. I could revisit Phuket, Thailand anyday. Such a lovely place and such nice people. The day tour to Similan islands was simply magical. Would love to go back again. My boyfriend would love to go to the Thai boxing camp! It would definitely be a little scary to participate in a real fight. I would like to see the Phi Phi Islands! The color of the water looks so beautiful! Any idea why Donald Duck Bay is called Donald Duck Bay? Is that the real name? Seems a bit random! As for $300 to fight?? No thank you! I suppose if you have no sense of personal safety and don’t mind potentially giving yourself concussion (or worse!) to pay for your holiday then why not, but I’d prefer just spectating. Sitting on the sidelines, well out of the line of fire. Phuket is such a lovely place, I’d be quite happy to return one day. Enjoyed reading your post as it brought back memories of going to the Phi Phi islands, they are beautiful. The Similan Islands sound like somewhere we should explore next. Great Photos too! thanks for sharing your tips. Great post about your Phuket trip. I would definitely like to visit those beautiful beaches and James Bond Island 🙂 fantastic photos! I loved the movie with Leonardo Dicaprio, The Beach so I must go on the Phi Phi Island tour. The James Bond tour sounds like a fantastic idea, we love visiting movie and movie locations. $300 to fight! Too dangerous, but man you are fit! We would love to visit Phuket someday and travel around the Island visiting the sites.